Regardless of whether you knit mittens knitting or crochet, the last step is binding vyvazhivanie thumb. Usually a great finger knitted on needles hosiery knitting (all of the front loop) or columns without nakida in the crochet. If you are knitting mittens on four needles, knit the basic pattern to the point where you want the base of the finger. After that, half of all loops of your part, divide by three and the resulting number of loops, clear English (or secure) the pin or the auxiliary thread. The number of loops can be different depending on the size of the mittens and the thickness of the yarn. On the needle, dial the same number of loops, thus leaving a hole for the thumb, and continue knitting basic pattern for the scheme. 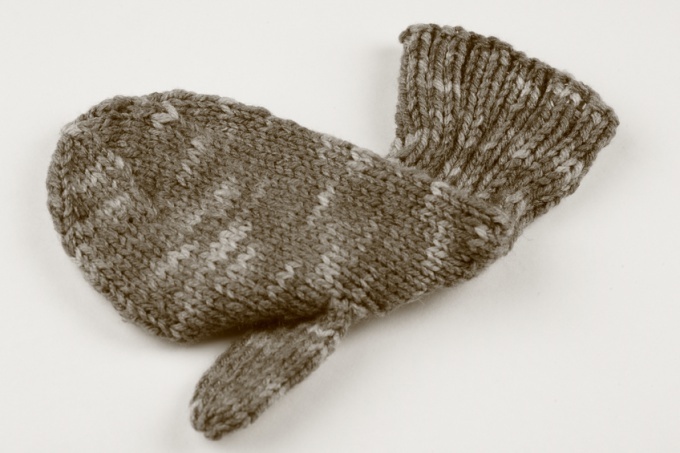 When you dovedale mitten, go back to the thumb. For this purpose the hinge pins (threads) set on the needle, the same amount of enter from the upper side holes plus one loop on each side. That is, if the pin was left 6 hinges to knit the thumb dial 6 + 1 + 6 + 1 = 14 loops and distribute them on three or four spokes (as you prefer). Next knit in a circle, until the end of the finger will not stay the distance in two rows. In the penultimate and last rows turn down evenly over three loops, and through remaining loops pull the rest of the thread and tighten. Pull the thread through the crocheted fabric, to hide the tip. Finger can knit some and crochet. This knit columns without nakida in a circle reserved holes. Towards the end of the heat evenly over the three loops in the last two rows and tighten the thread, pull it through the remaining loop of the row. For the subtraction of loops on the crochet better not miss the loop of the previous row and grab two loops (that is, a single column without nakida promazyvaya on two columns without nakida previous row). If you crochet with thick yarn, the finger can be linked and columns with nakida. If you use a thinner filament webs of columns with nakida is not very dense and has holes that mittens are out of date.